I want to see GWAR for the BLOOD! I want to see the chick from Kung Fu Dykes spray teet blood all over the place! I want to go because living too mainstream and this seems like the best way to die. I have got to see this incarnation of our alien masters! GWAR!!! Because I need more fake blood on my favorite Gwar shirt! I have never actually seen them before! I should rectify this. Ive never seen them, and I want to get covered in blood! And I want to meet Vulvatron shes hot. Before the world ends it’s important to follow the new scum dogs and watch them slay before heading back to Antartica! I haven’t seen GWAR since at the old 9:30 Club on F St. I was covered in guts and blood back then. It was a small club the old 9:30. I am old and would love to relive those fond memories! 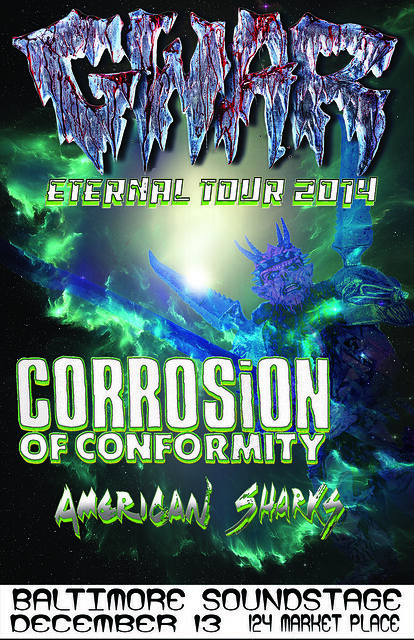 I’ve never seen GWAR or COC, now is the time to see them! My girlfriend agreed to go see GWAR as her first metal show! I missed the Gwar-bq and need my dose of GWAR. BECAUSE I MUST OFFER MY BODY AND BLOOD TO THE ALMIGHTY VULVATRON! To aid the new singers in the search for our beloved Oderus. Because they are Black and. Huuuuuuugggggeeee!!!!!! I want to see for myself how crazy the gal playing Vulvatron really is. I need to Honor Oderus. Seeing the New GWAR in action will do the trick.. I want to see GWAR remembering their fallen scumdogs at this show. I also want to see COC. Because I heard GWAR shows have all the best space-crack. Oderus ejaculated on me at my last GWAR show. Curious to see what Vulvatron’s got. I want to see them because they put on a great show and I’ve never gotten a chance to see them before! It’s GWAR!! And I’m a crack dealer and I see this as a good opportunity to sell a boat load of crack!